I have had a good couple of days with the Yuba. After 60 or so kilometres riding it two things were obvious. 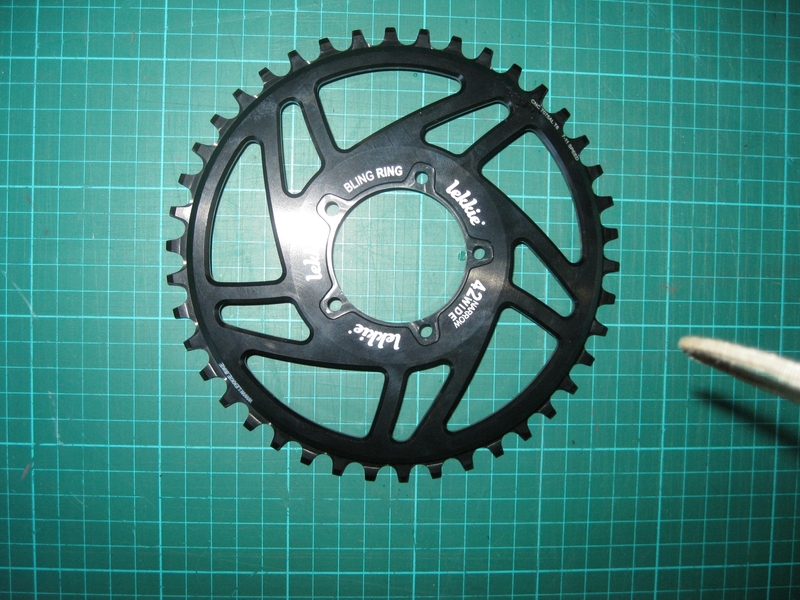 Firstly, the gearing needed work. Secondly – the “power profile” needed adjusting, i.e. the amount of assistance given at different road speeds and pedal cadence. This second point I will deal with when the programming cable arrives. 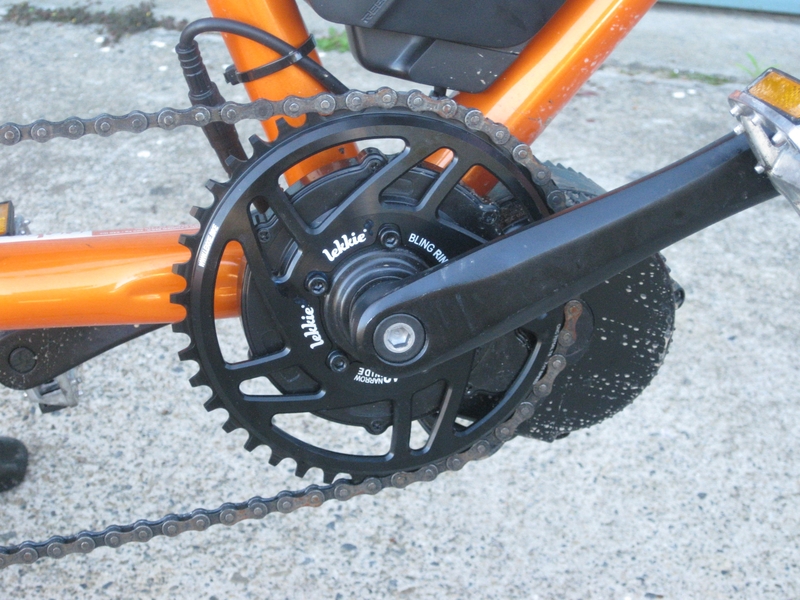 OK, when the Yuba was taken off the back of the car, it had a 38 tooth chain ring, riveted firmly to the crank. At the rear it had a somewhat rusty Shimano MF-TZ21 gear freewheel gear cluster, with cogs from 14 to 28 teeth (14,16,18,20,22,24,28). This bike has been a display model, and has spent its early life parked outside the shop. When I fitted the Lekkie mid-drive motor it came with a 46 tooth Bafang chain ring that was attached to the motor with 5 set screws. This gave much higher ratios, making for nice fast cruising along the straights, but a real struggle up the steepest hills. I didn’t want to revert to the super low original gearing, but I was struggling with the significantly higher geared new setup, even with the electric motor. So I looked around at alternatives. Firstly suppliers – you can get different sized Bafang chain rings, and quite cheaply, but postage and the delay put me off this choice. Lekkie also supply a range of Bling Rings, in sizes and colours to suit everyone. However, I just needed black. Secondly – what size – half way between 38 and 46 is the magic number 42, and Lekkie make a Bling Ring in that size! So I ordered a new 42T Bling Ring from Bicycle Junction at the standard price, who delivered it in a few days, free of charge, so a tiny saving there! Fitting is reasonably straightforward, after all I had only just fitted the original one. Looks good on the bike too. I took it for a ride to a customer’s house, who lives half way up one of the steepest streets in Whitby, and the difference is noticeable and it is much better. Pedaling top speed is down to about 32kph pedaling comfortably, but downhill pedaling frantically I can get about 39kph. The 32kph will eventually match the assistance from the motor when I have worked some magic on that. The lower gears are great. The whole range of gears is basically one gear lower, so the new second gear matches the old first gear, and is very suitable for the steepest hills on most of my rides. However, the new first gear was still a bit of a struggle on the very steepest hills. 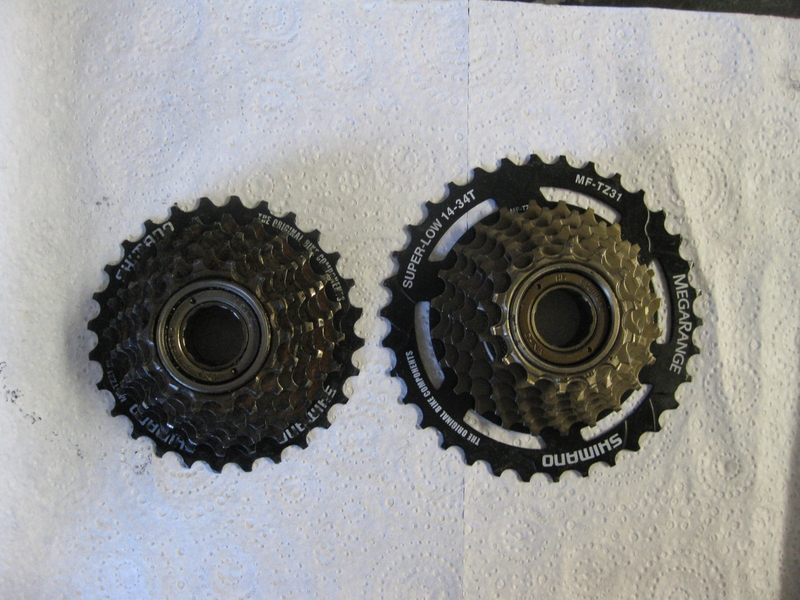 In my box of bits from the build of the first bikes are two Shimano MF-TZ31 freewheel gear clusters, bought in error when I was quite naiave about the various types of gearing systems available on bikes, and they have been sitting gathering dust ever since. However, they have been kept carefully packet away, so they are as new, no rust etc. These clusters are the same as the Shimano MF-TZ21 fitted to the Yuba, but the 28 tooth low gear has been replaced with a super low 34 tooth granny gear. So the gear set is 14,16,18,20,22,24,34. A quick bit of math shows that this cluster combined with the bling ring will give me a slightly faster top gear, and a slightly lower first gear than the original Yuba set up and a much lower first gear than either of the Bafang or Lekkie set ups. Perfect! So this morning I made my second attempt to replace the gear cluster. Two major problems occurred. 1. Holding the axle still while releasing the nut on the drive side of the axle proved difficult. Eventually I found a combination of wheel nuts and spacers that allowed me to tighten up two wheel nuts against each other on the non drive side, tight enough to hold the axle while the nut on the other side was removed. This needed to be removed so that the freewheel removal tool could be put over the axle and into the freewheel splines. 2. The freewheel removal tool happens to be the same one you use to remove cassette locking nuts, and I already had one from building the original bikes. The original bikes had 12mm axles instead of 10, so I had had to drill out the tool to fit over the axle. The Yuba has even bigger axles, 14mm I think, so I had to manually file out the hole in the tool to go over the axle. This took a while. Finally, I used a deep 15/16″ socket over the axle and tool, onto which I put on my 600mm long socket bar, which made short work of removing the freewheel from the wheel. The rest of the installation was really easy. So the gearing is now pretty good, I will take it for a ride soon to check it all out. The gear range with the original cluster was 28/14 or 2:1. With the new cluster it is 34/14, or 2.43:1, a big improvement. A table of the gearing changes follows. ‹ Electric Yuba – just how far will it go?